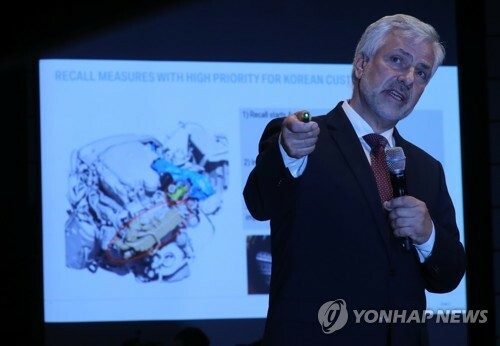 SEOUL, Aug. 6 (Yonhap) — BMW Group on Monday officially apologized for the fires that consumed some of its vehicles and stressed that the hardware issue cited for the problem is not specific to South Korea. The statement came as the German luxury carmaker held an “urgent” press conference in Seoul to explain the fires in its vehicles while outlining the company’s recall plans here. “The cause is only a hardware issue. It has nothing to do with software. And the root cause is not Korea specific. Similar rates are observed in other jurisdictions,” Vice President Johann Ebenbichler in charge of quality at BMW Group told the media. He cited the leakage of an exhaust gas recirculation (EGR) cooler as the main cause of the fire incidents that happened in the cars in Asia’s fourth-biggest economy this year. The vice president said the latest fires are “specific problems with the EGR cooler” in BMW vehicles. BMW used the same software and hardware for its vehicles sold in Europe and Korea. The EGR-caused failure rate in diesel-powered BMW vehicles sold in Korea is 0.10 percent, similar to 0.12 percent in BMW diesel cars sold globally, the carmaker said, without giving a specific timeframe. However, the company didn’t explain why EGR-related fires are concentrated in Korea this year. There have been 32 cases of fires in the engine compartments of BMW vehicles, mainly the 520d sedan, coming into 2018. BMW said it will recall 106,317 vehicles to make an emergency check on the EGR component at its 61 after-sales service centers around the clock during a two-week period starting July 31. The Ministry of Land, Infrastructure and Transport said 10 percent of BMW vehicles that underwent the emergency examination are at high risk of fire. The official recall is scheduled to start on Aug. 20 to replace the EGR cooler and module and clean the EGR pipe. The EGR is one of the principal devices used to reduce nitrogen oxide emissions from diesel engines. Meanwhile, two groups of Korean consumers filed a joint suit against BMW over the faulty part. More consumers are set to take legal action against the German company in the coming weeks. Last week, the transport ministry urged owners of BMWs not to drive their vehicles until safety issues are fully resolved. The ministry said it will as quickly as possible investigate what caused the fires in a thorough and transparent manner. It also vowed to review existing laws and regulations involving the recall system to prevent carmakers from taking advantage of loopholes that could jeopardize public safety.